A fire broke out earlier this afternoon along the Tassajara Rd. It’s apparently a little north of the Zen Center. A column of smoke is now (3:15pm) visible from the Salinas Valley. A lot of equipment is headed that way so, hopefully, folks will do their best to avoid the roads in the upper Carmel Valley, Cachagua and Jamesburg for the time being. Fire appears to be growing. Watch the smoke plume appear and expand on this satellite loop. Forest Service says about 500 acres have burned and there is zero containment. They say hotshot crews are currently hiking into the fire area. There are other, unconfirmed, reports that the fire has crossed Tassajara Creek and that the Zen Center is being, or has been, evacuated. The fire now appears on the Forest Service’s infamously balky Inciweb. From the photo on that site, it looks like it’s crossed Church Creek, rather than Tassajara Creek, although it does appear to be near, or at, the confluence of those two creeks (this is a little over a mile upstream of the Zen Center). On the bright side, they’ve reduced their estimate of acres burned to 150 (now pushed back up to 250). The Forest Service has just adjusted their estimate of the fire’s size back down again and it now stands at 169 acres. Based on the photo provided earlier by the Forest Service, we’ve put together a very rough map of where the fire appeared to be burning at the time the photo was taken. Please bear in mind that this is intended to give an idea of the fire’s general location. It should not be mistaken for an actual fire map. The fire has apparently quieted down for the night and its forward progress has been stopped. Firefighters are hopeful they’ll be able to keep it that way tomorrow. A cold damp night seems to have brought active burning to a halt. Temperatures were in the 40s overnight and the marine layer (i.e. fog) worked its way all the way up to Arroyo Seco, if not beyond, raising relative humidity levels to over 90% only a little downstream from the fire location. The overnight thermal imaging satellites detected no heat from the fire and firefighters will be working hard this morning to prevent rekindling along the fire’s smoldering edges. No easy task in this extremely rough terrain. A couple of heat detections from 2:53 yesterday afternoon have belatedly showed up in the MODIS thermal satellite data files. Not sure what took them so long, but here they are. The yellow points are where the heat was detected, although the fire could actually have been anywhere in the larger yellow squares (or even beyond them). The technology just isn’t that exact. This would have been shortly before the fire crossed Church Creek and ran up the hill to the west. Meanwhile, the Zen Center folks are saying that the fire is now 15% contained. No word from the Forest Service. A new update on Inciweb indicates the fire is still 169 acres, but rates growth potential as “medium.” There is no mention of any containment. Confusingly, it says both that crews will continue to construct line and that, due to terrain, crews have not been able to gain access. We’ll take that to mean either that they haven’t yet reached all parts of the fire perimeter or, more likely, that the sentence about not gaining access is a leftover from yesterday. 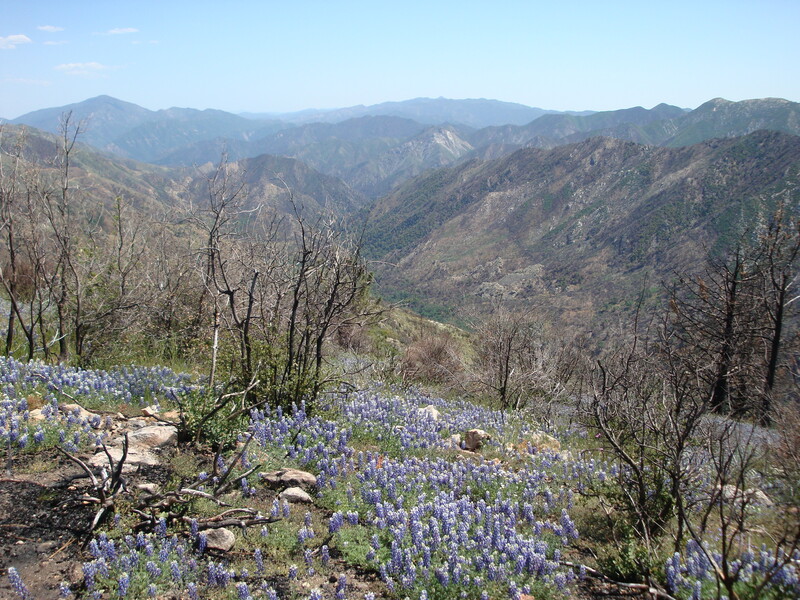 They also state that the fire is burning Santa Lucia fir (a rare tree which grows only in the Santa Lucia Mountains). As most Santa Lucia fir grow at higher elevations, we’d be surprised if there were many, if any, in this area. 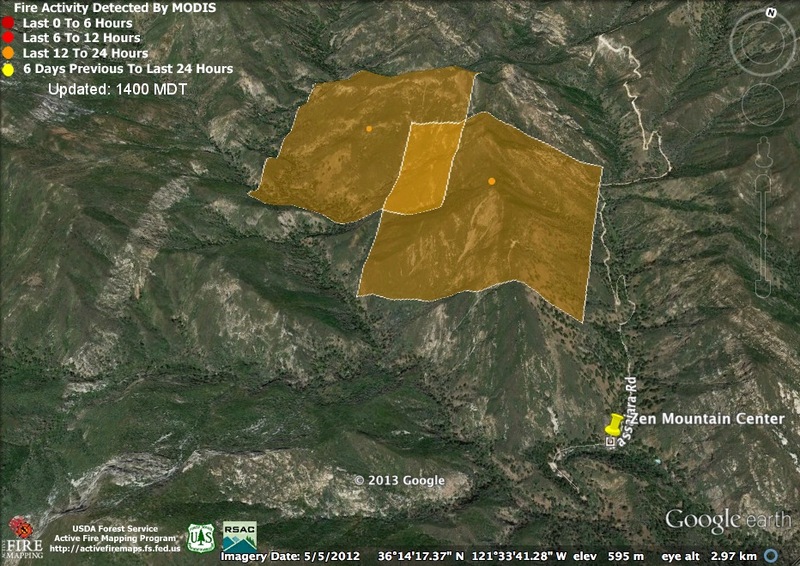 Maybe they mean Santa Lucia fir would be threatened by expansion of the fire onto higher ridges? It’s worth noting that the area where this fire is burning was thoroughly burned over by the Basin Complex Fire in 2008. The burn intensity maps from that fire indicate a pretty hot burn there. Depending on what part of the Inciweb page you read, there is either zero or 5% containment this evening. The good news is that the fire did not, apparently, expand today beyond the perimeter it established yesterday. Acreage remains at 169. This is good but, as we saw more than once during the Basin Complex, a fire perimeter uncontained by firelines can sit quietly for weeks, then explode into life as soon as humidity drops and winds align with terrain. So a big thank you to the men and women working hard out there to get those firelines cut before the weather shifts. Inciweb has also published a list of trails which, due to the fire, they do not recommend for use at this time. It’s a perplexing list, though, as it includes the Carmel River Trail from Los Padres Dam to Hiding Camp, far from the fire, but not the section of the same trail, from Hiding Camp to Church Creek Divide, which is closest to the fire. It also includes the entire Pine Ridge Trail from China Camp to Big Sur, but not the Black Cone Trail, which the fire would have to cross before getting to any of the Pine Ridge Trail west of Pine Ridge. Most surprisingly, the list fails to include the three trails closest to the fire (Church Creek, Tony, and Horse Pasture). Our advice would be to avoid any and all trails and camps in the Church Creek, Tassajara Creek, and Willow Creek drainages and to keep off the Tassajara Rd. (which is currently closed anyway). Doing that will keep you far from the fire and well out of the way of the firefighters. The fire is now 55% contained. There was a roll-out of burning material which burned an additional 5 acres, so total size is now 174 acres. Full containment is predicted for Tuesday, July 23. 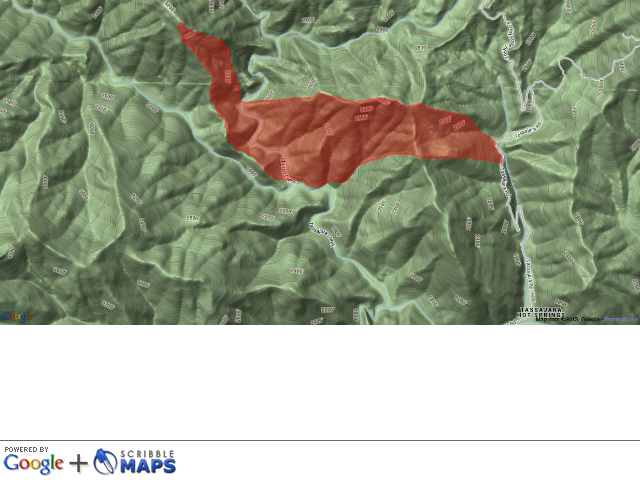 A fire map has been released by the Forest Service which confirms, as we suspected, that the fire crossed Church, rather than Tassajara Creek. It also indicates that the fire did not originate on the Tassajara Rd., which we had assumed it had due to early reports of fire “along the Tassajara Rd.” (easy to believe since nearly all non-lightening caused wildfires in our area ignite along roads). Instead it appears to have begun near the confluence of Tassajara and Church Creeks, an area commonly frequented by guests of the Zen Center. This entry was posted on Wednesday, July 17th, 2013 at 3:19 pm and is filed under Fire, Flood & Apocalypse, Santa Lucias. You can follow any responses to this entry through the RSS 2.0 feed. You can leave a response, or trackback from your own site.